A Facebook business page gives you a platform to communicate directly with your audience. And as you hone your skills on the platform, you can target your message with greater accuracy to get better results. For this to happen, you will need to make a Facebook business page. While Facebook has been undergoing one crisis after another, starting with the Cambridge Analytica scandal and others, the platform has not been tarnished. As a matter of fact, 58% of small businesses told The Manifest they would be spending more on Facebook marketing. With 80% of small businesses already using Facebook, their reliance on it for their local marketing hasn’t wavered. This is because there are still over a billion and half active users and those are numbers that can’t be ignored. With so many potential customers on Facebook, and more likely on the way, it’s almost a must for businesses to have a presence there. 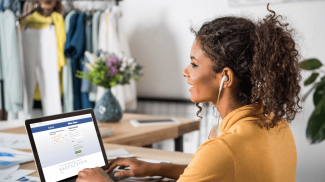 If you want to know how to create a Facebook business page, but aren’t sure where to start, here’s a simple step-by-step guide to help you get the most out of your new page. 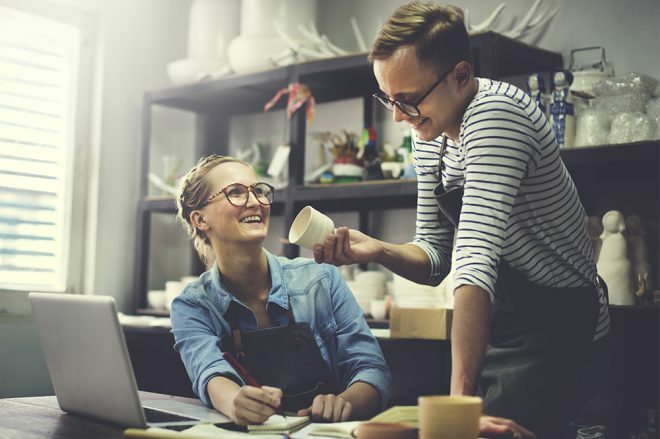 From there, you can narrow it down even further by specifying exactly what type of business you have within those categories. For example, you could specify that you run a food service business, real estate office or event planning business. Then just enter your business’s name to continue. Then it’s time to actually add information to your Facebook page. There’s a section that lets you add a few paragraphs — up to 155 characters, — to tell people what your page is all about. There’s also a section where you can add your website and even enter a custom URL for your Facebook page so that you can easily share your page with others. A profile photo can help you make your page stand out and fit with your company’s branding. 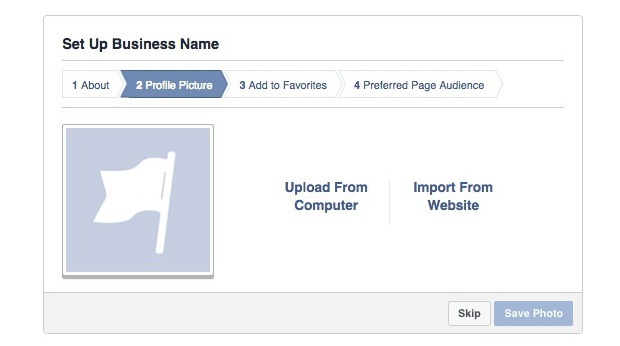 After you add your basic business info, you’ll be directed to a page where you can add a profile photo to your page. This can be your logo, a photo of yourself or your team, or even a promotional image. From there, you can add the page to your favorites so that it will be easily accessible on the sidebar of your Facebook homepage. But you can also specify the target audience for your page so that it’s more likely to get in front of the right people. 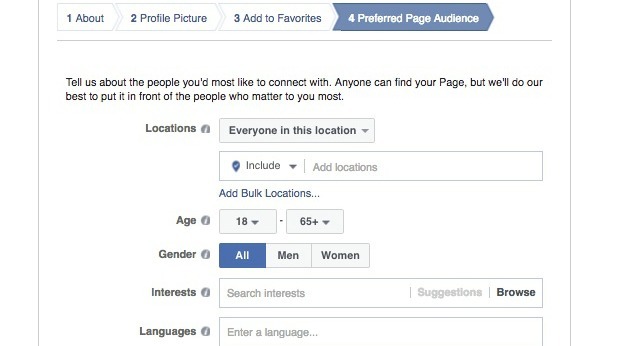 You can outline your audience by location, age, gender, languages and even interests. You can search for specific interests or browse general categories like entertainment and hobbies and then see some more specific niches within those categories. Even though you may have already added a short description and website, there are some other details that might be helpful to your customers if included on your page. Once you have the basics set up, you can visit your page and add things like your address, phone number, business hours and price range within your page’s About section. Your profile picture is just one small way to add some visual interest to your page. 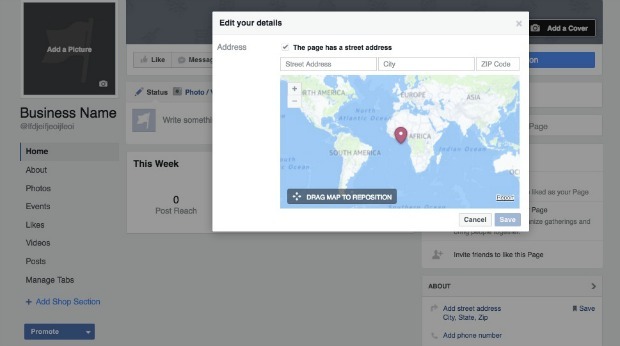 You’ll also likely want to add a cover photo, which will appear at the top of your page. And you can also add other photos or albums of photos. 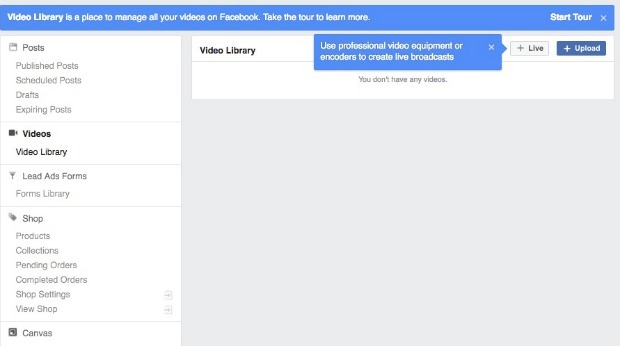 Facebook even lets you upload videos or record live videos, which can also be saved on your page for visitors to watch later. Need ideas? Click here for seven ways to find inspiration for social media content. 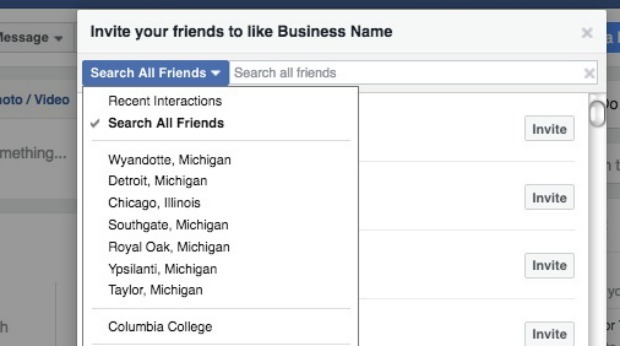 You also have the ability to invite your Facebook friends to like your page. This doesn’t mean you need to send a blanked invitation to everyone you know. But if you have some Facebook connections that you think might enjoy what your page has to offer, send an invitation and see if they accept. If they like what they see, they might even invite some of their other connections. Click here to learn about a more advanced, and very effective, way of getting more Facebook likes. 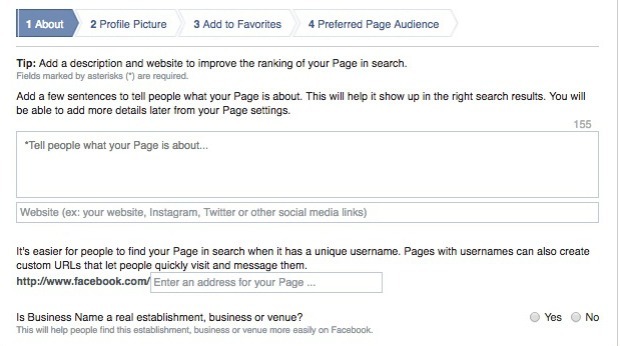 When people visit your page, they’ll see your feed of activity. But they can also choose to see specific things like your photos, videos, events or likes. And they can find all of that different info by selecting a tab on your sidebar. 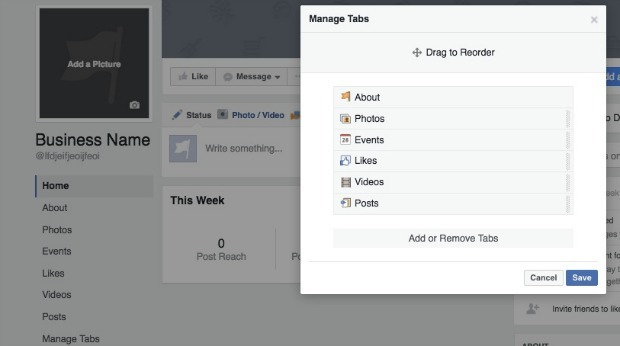 So once your page is set up, you can add different tabs or manage the ones that appear there. For example, if you really want to promote events held at your business, you might move that tab up to the top of the list. You can also add tabs other than the ones that automatically appear. 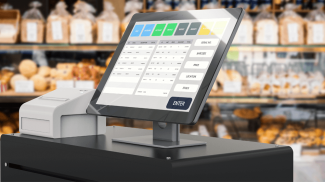 One of the most popular sections among businesses is a shop section. 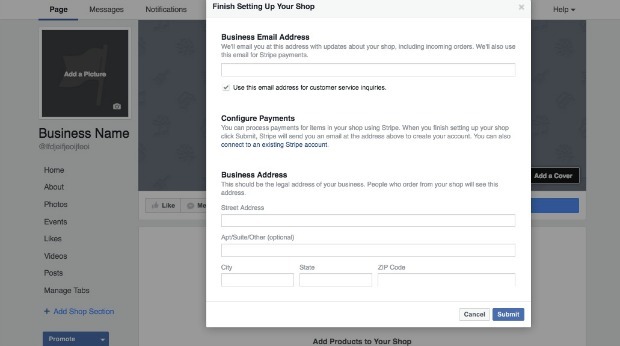 By agreeing to Facebook’s terms, adding a payment method, adding a way for people to contact you with customer service issues, and adding products, you can let people shop for your products without actually leaving Facebook. You can also add a specific call to action button toward the top of your page. 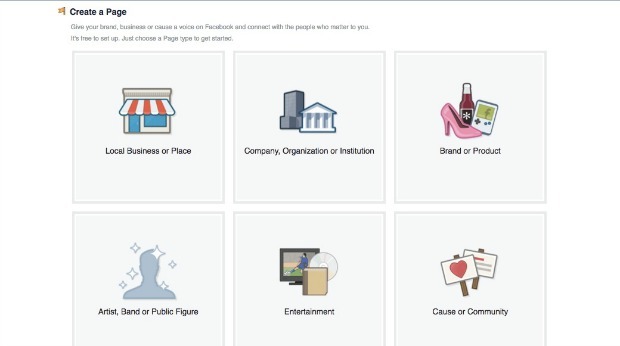 Facebook offers several different options you might consider, depending on your goals for your page. For example, you can add a button that lets people contact you. You can set up one that directs them to a mobile app. You can have them book an appointment. Or you can choose from several other options. 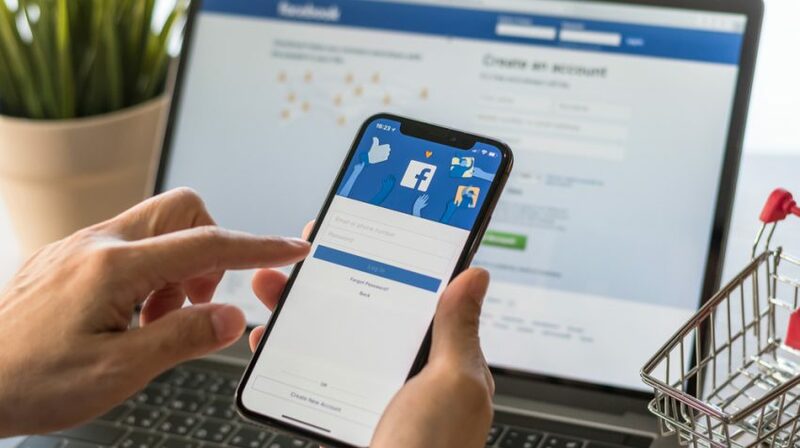 * * *Whether you’re selling handbags or handkerchiefs, promoting a new book or a new place to eat around the corner, Facebook offers an ever-increasing range of options for promoting your business to an ever larger community. With just a little know-how, you can break off a little chunk of Facebook’s huge global community to become your newest clients or customers. I think creating a Facebook page is pretty straightforward. The problem is how to promote it so that you can reach your target market successfully. Thank you for so detailed description! Of course it is only one step of the long process. Next mostly important step will be a content of your page. No matter how perfect your product is, if you can not make good advertising and brilliant content support, all efforts will come to naught. You have produced a fantastic step-by-step way to create a Facebook Page. Having one that’s professional looking is crucial these days. Creating a Facebook page is important but the most difficult job is to get maximum organic audience impressions as Facebook is continuously making it more and more difficult. So go for the Facebook marketing and target demographics properly, run the campaign, analyze data, tweak the campaign, test he results and repeat the whole process again and again.